« How Is Copyright Infringement Like An Ugly Car? 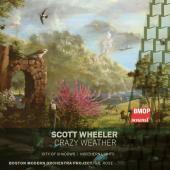 As evidenced by Crazy Weather, Boston Modern Orchestra Project’s latest recording of music by Scott Wheeler, the composer really knows his way around percussive sounds. Even on pieces for strings like the title track, there is the ‘thwack’ of pizzicatos and bow slaps to help propel the proceedings. Pacing is another strong suit of Wheeler’s. The shadowy passages of City of Shadows are balanced by flurried gestures that enliven the music and help to articulate the work’s overall architecture. The outer movements of Northern Lights give the impression of intense and quicksilver slalom runs, while the middle movement, marked “Still and Granitic,” provides a portentous counterpart. This entry was posted on Sunday, November 23rd, 2014 at 10:50 pm	and is filed under The New Classical. You can follow any responses to this entry through the RSS 2.0 feed. Both comments and pings are currently closed.